A moderate solar storm is underway today (March 12), following a series of solar flares that erupted from the sun over the weekend and last week. On Saturday (March 10), two M-class solar flares blasted from the surface of the sun, hurling a stream of plasma and energetic particles, called a coronal mass ejection (CME), into space. This CME reached Earth today and is causing a geomagnetic storm as the charged particles interact with the planet's magnetic field, according to the federal government's Space Weather Prediction Center, which is jointly managed by the National Oceanic and Atmospheric Administration (NOAA) and the National Weather Service. "Geomagnetic storming reaching the G2 (Moderate) level is underway," officials at the Space Weather Center said in a statement. "Continued geomagnetic activity reaching the G3 (Strong) level is likely between now and the end of March 13 as the parade of recent coronal mass ejections affect Earth." Strong sun storms can cause increased levels of solar radiation in space, and can generate geomagnetic storms when they reach the planet. Strong X-class flares aimed directly at Earth have the potential to interfere with power grids and communications infrastructure on the ground. Increased solar activity can also supercharge normal aurora displays (also called the northern and southern lights), and this weekend's eruptions could produce some dazzling light shows for well-placed skywatchers over the next couple of days. "High-latitude sky watchers should be alert for auroras," astronomer Tony Phillips wrote on his website Spaceweather.com, which monitors space weather and skywatching events. The recent outbursts all came from an active sunspot region, called AR 1429, that already unleashed three strong X-class solar flares last week. These powerful eruptions triggered the strongest solar storm in eight years, according to solar physicists at the Space Weather Prediction Center. But sunspot region 1429 is rotating away from the central meridian of the solar disk, and is not expected to pose much of a threat this week. "Region 1429 remains complex, but is showing signs of weakening," scientists at the Space Weather Prediction Center said. "No significant Radio Blackout events have been observed in the last 24 hours, so no further significant activity is currently expected after March 13." Still, space weather scientists will continue to monitor this region, as well as other potentially active regions on the sun. The sun is coming out of a prolonged lull in its 11-year weather cycle. 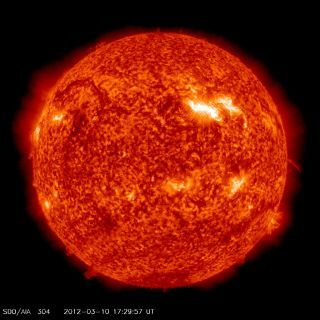 The current cycle, known as Solar Cycle 24, is expected to reach its peak level of activity in 2013, NASA officials have said.